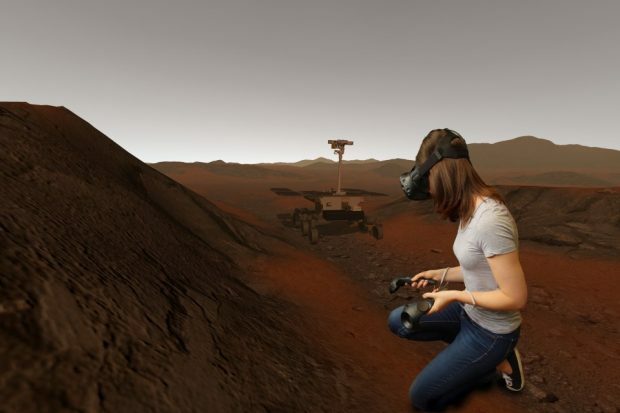 Dr Claire Cousins, from the University of St Andrews, who is contributing Mars geology expertise to the project, using the VR set at Aberystwyth. Not your usual beginning to a working week, but I headed off to a very cold and windy Aberystwyth University to visit Dr Helen Miles and Dr Matt Gunn to have a look at their progress with creating a virtual reality Mars you can walk around. It was in a small, mostly empty office where I was offered a headset, and two unusual looking controllers. Controllers in hand I looked around me as the screen dissolved and was replaced with the landscape of Mars, complete with ExoMars Rover trundling along towards me. Not wanting to find out what would happen if it ran me over I leapt to the side before realising that actually it wasn’t real so it wouldn’t have hurt me. That’s how realistic it all seemed, everywhere I looked I could see the famous red terrain, and after being taught how to use the controller to move around I hopped about, climbing to the top of ridges and standing right in front of the ExoMars Rover (once it had stopped of course) to see how tall it is. All of the images were actual images taken by previous rovers on Mars, so it really was the next best thing to actually being there myself. The ExoMars Rover is a part of the ESA ExoMars programme aiming to look for signs of life on Mars. The Rover is UK built and houses many instruments from various European countries and Russia, which will be used as it traverses the rocky landscape of Mars. The UK has been involved in the Rover software and some of the instruments; the PanCam (Panoramic Camera) instrument is led by UK scientists and will provide photos of the terrain which will help geologists determine the history of Mars. 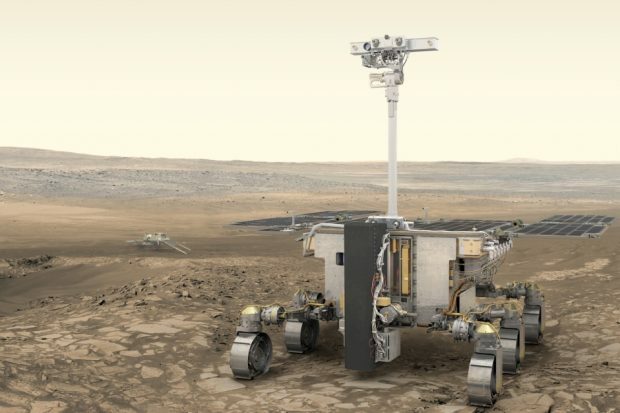 Artist's impression of the ExoMars Rover. Credit: ESA. Once the ExoMars Rover lands in 2021, Dr Miles and Dr Gunn are hoping to develop the technology further to allow the data gathered by PanCam to be used by the system, to scale, allowing scientists to go for a walk around the areas visited by the Rover and examine the rocks as if they were actually on Mars. This could help increase the speed at which things are discovered, as well as providing a fantastic tool for outreach. What could be a better start to the week than visiting Mars to see what the Rover has been up to lately, all from the comfort of your own living room?